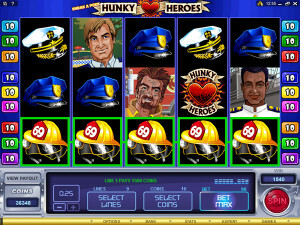 Hunky Heroes has a theme that I haven’t seen approached before, being designed with a focus on all kinds of uniformed heroes, from firemen, to air force pilots, lifeguards, policemen or navy guys. It seems like a great game for a lady that wants to have something nice to watch while the reels are spinning, something that the guys have had in plenty of titles before. Microgaming is the designer behind this game, which is quite different from the others that you might’ve found in the past. Hunky Heroes has only 9 lines for you to bet on, in a 5 reel layout, so you’re not going to spend a lot of money in order to see the hunks, or to gain access to the bonus games and the wild symbols. You also get scatter symbols and free spins with multipliers along the way. The top payouts will put up to $10,000 in your account. The game isn’t just something pretty to look at, it actually has some wonderful features, including wilds, scatters, bonus games, free spins and x3 multipliers. The Hunky Heroes Logo is wild in this case, the symbol appearing on all the reels, and with a bit of luck on the same payline as well. A five symbol combo with just wilds will put up to 4,000x the line bet in your pocket. The rest of the time, when you don’t form a combo with your wilds, they will contribute to the formation of other combinations, on the lines on which they are present. They can’t replace a scatter or bonus symbol though, even if they’re in the right spot to help out. This bonus game will put up to 5,400 coins in your account, but first you have to trigger the feature. You need a single Sneak a Peek symbol to land on the 1st reel, in any position, and that will mark the same position from the 5th reel. If a Hunk symbol lands in that position, you get the bonus game. It seems a bit too elaborate to get it started, but there are five different symbols with Hunks that can help you out, so it shouldn’t be too difficult to trigger. During this feature, you have to match three identical items, in order to complete a set. You win a multiplier from it, plus you can sneak a peek at what’s hiding behind another one. You can select up to 12 of the 15 blocks, getting multipliers whenever the sets are completed. A bonus symbol is also present, the image of a pair of underwear. You need three bonus symbols, on an active line and on the first three reels, to get this feature started. 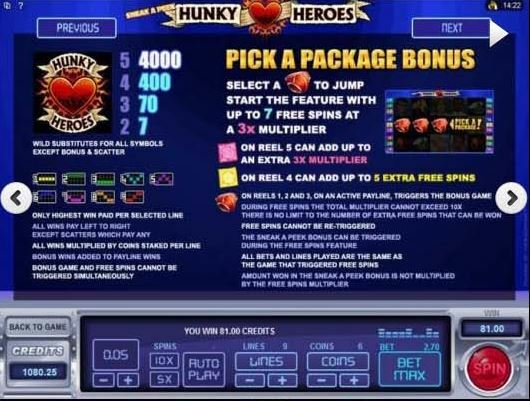 You have to pick one of the packages, and you get additional free spins and multipliers. As the free spins are played, you can win additional ones whenever yellow condoms appear on the 4th reel, while an extra 3x multiplier is added when a pink condom is on the 5th reel. The line bet can go from $0.01 to $2.50, with 1 to 10 coins selected, and with denominations between $0.01 and $0.25. When all the lines are active, you can spend up to $22.50 on a single round of Hunky Heroes. Top rewards of the slot will give you 4,000x, or 40,000 coins. That’s only $10,000 cash. Quite a bit of work seems to have gone into the design, but most of it has been spent on the symbols. The betting area looks like it’s part of a ship’s control center, using metal and displays. The background picture is the only one that disappoints, being a simple blue image, nothing to enhance the design there. The rest of the images, with objects and the five hunks, are cartoon style and at least decent looking. 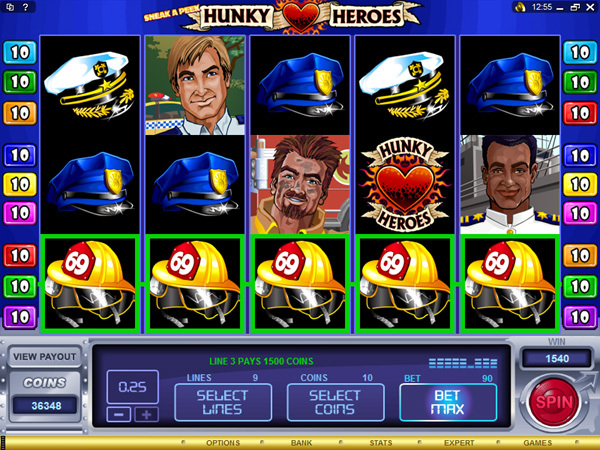 Symbols: Hunky Heroes Logo (4,000x, wild), Package (bonus), Pilot Roger (2,000x), Navy Wade (1,750x), Policeman Duncan (1,500x), Fireman Patrick (1,000x), Lifeguard Brad (700x), Pilot Helmet (400x), Navy Cap (300x), Policeman Cap (200x), Fireman Helmet (150x), Baseball Cap (100x) and Mars Arrow Sign (100x). For the ladies it is, as the game can be very attractive. Men might want to look for something with ladies instead of hunks, and there are a lot more options out there that include them. 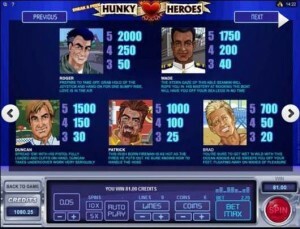 The Hunky Heroes slot machine is offered through the Microgaming platform, so if you want to play it for real or just to practice, look out for casinos that use it.